As the primary purpose of this website is to use and understand cluster analysis the purpose of performing market segments, some of the above approaches to market segmentation have links provided for more information on those particular topics. Cluster analysis is a statistical tool designed to group large amounts of data into similar sets. The word “cluster” simply refers to a related group or set. Our purpose of using cluster analysis in marketing is to take consumer data and group it into related sets with the prime intention of establishing market segments – or perhaps looking at different array of market segments. Our marketing goal of converting consumer data into market segments is highlighted in this diagram. 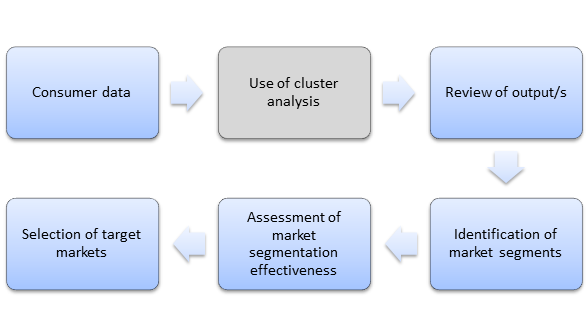 As you can see, cluster analysis takes consumer data (either from a market research survey or from some form of a customer database) and helps to group it together and provide numerical outputs that can be used to develop market segments. Therefore, cluster analysis has a clear intended outcome for the marketer – to form market segments. This means that we only want to utilize cluster analysis as a tool, and we (marketers) don’t need to get too preoccupied with the actual statistical calculation. 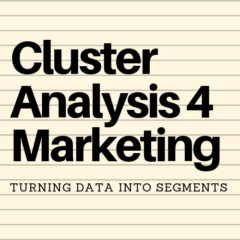 However, this cluster analysis for marketing website mainly offers information for cluster analysis with marketing, but with some supporting technical information as well. As an additional resource, if you are interested in the calculation side the various forms of cluster analysis, here is a link to a more detailed statistical site covering K-means clustering. Cluster analysis requires data to run and group into segments. This data needs to be related to consumers only – not to competitors or sales or any other information that you may have. If you do not have access to numerical information on consumers, then cluster analysis will be of no use to you – and you will need one of the alternative methods of developing market segments as listed above. The most common sources of data for use in cluster analysis include the firm’s customer database information and/or the findings from a market research survey. You always need to keep in mind that at the end of this analysis that the purpose is to define new market segments. Ideally this should be (but not always) a new and interesting way of looking at the market. If your firm can have a different view of the market – sometimes referred to as a marketing insight – then this will help the firm gain a potential competitive advantage in the marketplace. Alternatively, you may be looking to refresh the firm’s marketing strategy – perhaps a change is needed or the old strategy is not as successful as it was in the past. In this case, rethinking the approach to the firm’s market segmentation, using cluster analysis, could be quite beneficial – and definitely worth the analytical effort to explore. While the identification of viable market segments is the key purpose of utilizing cluster analysis – and appropriate market segmentation is really the starting point for the development of your marketing strategy. Therefore, in your clustering and segmentation process, keep in mind that a suitable marketing strategy needs to be developed and implemented using your segment/s (that is, your selected target markets). By using cluster analysis, and then trying to make sense of the outputs, you are required to think about the market segmentation structure and how it makes sense (or otherwise). Through this process of thinking about the mix of segments, you should gain a much better understanding of the marketplace – and perhaps discover a few marketing insights along the way.